Browse through my bromeliad hybrids and share my experiences in the world of bromeliads. 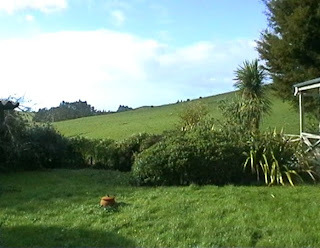 In mid 2002, we shifted house to 304 Matakana Rd about 10 minutes drive from Pt Wells, where we established a retail shop. We traded from there till mid 2007, selling many thousands of bromeliads. Our largest sales were held on holiday weekends, such as Easter and Labour Weekend (end of October). Matakana is a major holiday destination for nearby Auckland, and hundreds of cars would zoom past our place every day. We hoped to catch their attention with this big guy, stuck on top of our sign! This Alcantarea imperialis Rubra was one of a matching pair in large pots in our garden, and when it started to flower it kept falling over, so I cut it off at the base and wired it to the sign, where it stayed for the next two years. What a survivor! Underneath the sign was a garden planted up with tough spiky plants such as Aechmea distichantha, Bromelia balansae and Puya species. We also had various cacti and succulents, including one cactus that proved to be an attractive target for druggies, even though it was surrounded by spiky plants. After the second time it was hacked down I came up with a cunning plan. I whacked some 3 inch nails into a bit of timber and buried this just in front of the cacti in question. A few months later some linesmen needed to work through the garden, so I showed them where I thought the nail plate was. Of course the next step I took, I found it. Aah, here it is I said as two nails went through the bottom of my foot. I could hear them chortling as I limped off with a trail of bloody footprints behind me. In its heyday, we stocked hundreds of plants at a time, both as pups and as fully grown plants. The pups were very popular with collectors, as this was quite an economical way of buying a number of different varieties. At any one time we would have about 100 varieties of pups for sale. The mature plants were either outdoor landscaping types, or indoor flowering types. Popular amongst the outdoor plants were the large Neoregelia, such as 'Exotica Velvet' and the small red Neos, such as 'Fireball' and 'Short & Sweet'. Big foliage Vriesea were also very popular and of course Alcantarea. The property had a lovely conservatory, built on the concrete foundations of an old house that had burnt down. It was sunk into the ground on one side, which meant the concrete was constantly wet and allowed mosses and ferns to grow over it, making a lovely ambience. Inside the conservatory the pups were displayed on large boards, with the more cold sensitive flowering types such as Guzmania and small Vriesea on benches around the perimeter under the ferns. Once we had the shop set up, attention shifted to the gardens. Although only a 1/4 acre, this was a big job as the property had been neglected for about a decade. Essentially it was just lawn, with a border of scrub and ladder fern. That was fine, I don't mind clearing stuff, but the soil was horrible. Heavy, sticky clay, hopeless for bromeliads and most other subtropicals. Once the greenery was cleared, the solution for the soil was dumping loads of old potting mix on the gardens. Eventually we ended up with about 5-10cm of good soil, which the broms were planted in. Check out the difference between the photo looking east, and the next one taken from almost the same spot only a couple of years later. As you can see, the growth in only two years has been nothing short of incredible. In this photo, Vriesea altodessarae is flowering under the weeping cherry, with Neoregelia 'Exotica Grandiose' in front of the bird bath, Neo cruenta hybrid in the ground and Neoregelia 'Exotica Imperial' on the tree fern stump. Behind them are Heliconia subulata and Musa velutina. We used the Musa as a really fast shelterbelt and divider between the upper and lower parts of the garden. It was so effective and much less work than a traditional hedge, only needing old stems chopped out in late spring. The garden had a mix of shady and sunny areas, with the shade created by fast growing subtropicals like Musa ensete, Queen palms and Cherimoya. As much as possible I used various foliage plants to complement the bromeliads, as a garden full of bromeliads only can look too overpowering. In this case, a polka dot plant nicely mirrors the colours and patterning of this Neoregelia burle-marxii cultivar. This plant was the parent of the 'Exotica Leprechaun' type cultivars and I am particularly keen on the white underlying the heavy lilac spotting in the centre. This was one of the sunnier areas, with a little shade from a couple of young Brazilian fern treesThis bed was mostly Neo hybrids that I had bred but hadn't yet named. Although I try and avoid using massed plantings of bromeliads, this is one of the later beds to be developed and I did not get the chance to grow other plants for this area. Still a good effect though, and I have seen some brilliant massed plantings in other peoples gardens, so it is a useful technique. It's probably pretty obvious that my favourite style of gardening is pretty informal. I love the jungle path feel, where you walk through the garden via paths surrounded on both sides by lush foliage and colourful flowers. Not for me sterile formal gardens, or excessively masculine palm and agave type gardens covered in rocks. I like gardens that transport you away from reality for an instant, and a glorious profusion of colour and scent to assail the senses. Nothing subtle here! I must admit I felt quite sad when we sold this property in mid 2007, although I will never miss that soil. I made sure that I kept at least one of each bromeliad on the property to take to the new place. I did have to leave behind my two favourite non bromeliads though, a hybrid palm (Butia x Jubaea) that I had created in the 1980's and a lovely Ficus dammaropsis. Both were too difficult to shift. And finally, here are some shots of the production greenhouses at the time. When we finally decided to close the doors on the business in 2008, there was an estimated 60,000 bromeliads in stock, including mother plants and young plants, but not including many thousands of seedlings in seed trays. The number of cultivars is unknown, as there were so many unnamed hybrids waiting to be named and photographed, but I would estimate at least 1,000 were in there. We started the sales process by selling to other commercial growers, for example one grower brought a thousand or so Neo 'Perfecta Tricolor', another brought hundreds of Wittrockia 'Leopardinum' and Neo 'Exotica Velvet' also went out the door in their many hundreds. After that, Todd, who had worked for me for many years, decided that he would like to continue with the online sales of bromeliad pups, via the Exotica website and also the Trademe Exotica listings that we had set up. Seeing that Todd was the main force behind running this side of the business, it made sense, and he selected out enough stock to continue on his own account. Once most of the commercial scale stocks were gone we opened the doors to the many keen collectors. These came with trucks, vans, people movers, trailers and utes. Some of the sights were quite amusing as passengers tried to fit into cars crammed full of spiky broms. Some people came back half a dozen times, taking a load of plants each time. The plants were going incredibly cheaply. Whole trays of seedlings for a few dollars. Big Vriesea and Neoregelia hybrids for $10, $15 or $20 each, smaller plants, for example Neo 'Crimson Nest' were going for $5 each. Sometimes it was more hassle than it was worth to try and count the plants, so I just gave them a price for the lot, for example $1,000 for a van load. At times it got quite crazy, with plants going out the door by the van load! Finally, the landlord (these were leased greenhouses) brought the remaining plants to landscape his large property, what a relief, as this also saved us a massive clean up job. Now all I had to do was sort out my collection of bromeliads that were waiting for me at our new property we had purchased in 2007. Not many, just one of each I had promised Angela. Well, one of each somehow came to 20 van loads! It was truly one of each, but admittedly some were one clump of each and as I assured Angela, some that looked the same as each other in fact had slight differences, which made them potentially new cultivars. And then there were the ones I just couldn't part with. Oh dear, the confessions of an addict. I'm still working through them, most are still in their original boxes they were transported in! I'm a fanatical Bromeliad collector, hybridiser and general gardening fiend from Pt Wells, a little village one hour North of Auckland, New Zealand's largest city. Pt Wells is known as the garden village, on account of its' deep black peat loam soil and subtropical climate. Here my partner Angela and I and our two kids garden to our heart's delight, using organic and sustainable principles. In my professional life, I am a qualified Horticultural Consultant, specialising in complex analysis of cropping problems and am often called upon as an expert witness in crop loss claims. Check the website www.croplink.co.nz for more information. With Angela, I own the franchise for Mike Pero Real Estate for the Northern half of Rodney District, including Warkworth, Matakana, Omaha, Leigh, Snells Beach & Algies Bay. See www.matakanacoast.blogspot.com for more info.